William Shakespeare is one of the best known author of plays. And even if one hasn’t read or seen any of them at all, some sentences seem to be familiar, written forever in the memory of mankind. But little is known about the man who was born in Stratford, went to London to write and perform his genius plays, retired to Stratford where he died. We can only imagine that he hat books important for his work, that he had friends to chat with and that he had some belongings dear to his heart. What remained of his life are property transactions, a marriage license bond or christening records. Stephen Greenblatt gets behind these documents and brings the human being behind the genius that was William Shakespeare to life. Though Shakespeare imagined worlds while creating his plays, he always was very aware of the real world: “Shakespeare understood his world in the way that we understand our world – his experiences, like ours, were mediated by whatever stories and images were available to him”, Greenblatt writes. Stories he may have read or heard while sitting in a pub, listening and watching the people around him, stories he needed for his plays, hints that are visible in his work as Greenblatt explains his reader. seem to me all the uses of the world!” Hamlet, I,2. But, according to Greenblatt, we find more of Shakespeare’s own feelings and his grief about the death of his boy, the 11 year old Hamnet. Although it took him a few years (maybe he had to recover from the loss of his boy), Shakespeare managed to “respond with the deepest expression of his being” and gifted the world with “Hamlet” – playing the ghost himself. 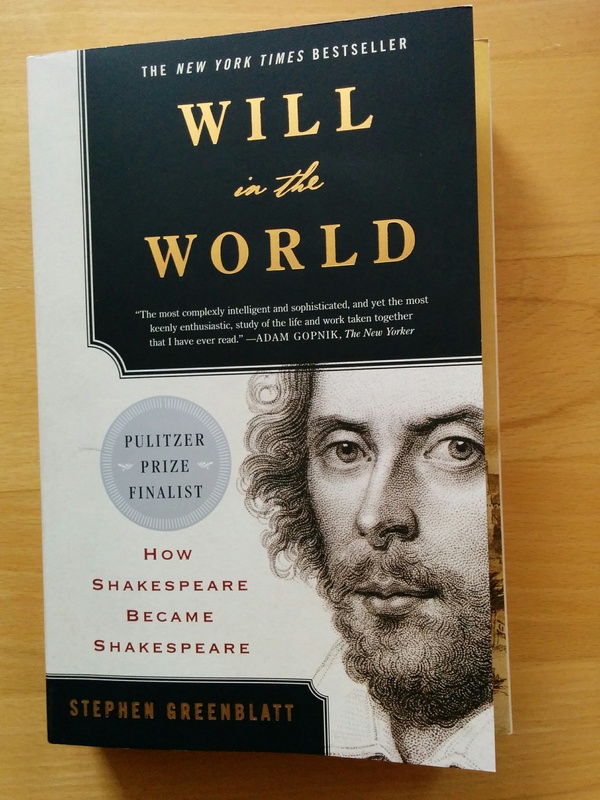 “Will in the World” is an entertaining read filled with countless references to Shakespeare’s work but without any educative tone. Those who want to read more get pages of bibliographical notes for further studies.